On July 23, the Centers for Medicare and Medicaid Services (CMS) issued its proposed CY 2019 payment rate regulation for hospital outpatient departments (HOPD) and ambulatory surgery centers (ASC). The proposed regulation will soon be published in the Federal Register; OOSS and other interested parties will have an opportunity to submit public comments until September 24, 2018. The rule incorporates a number of policies for which OOSS has advocated for many years. After years of lobbying by OOSS, CMS has proposed that, for the period 2019-2023, it will update ASC payment rates by the Hospital Market Basket rather than the lower Consumer Price Index-Urban (CPI-U). OOSS has been a leader in the effort to effectuate this change for over twenty years, seeking to persuade both CMS and Congress of its merits. Under this new policy, ASCs would receive the same update as hospitals, subject to certain adjustments. While CMS has actually proposed that ASC rates be subject to the higher Hospital Market Basket, the agency is soliciting comments regarding whether, instead, the CPI should remain in effect for the next five years while CMS collects evidence to justify a different payment update or ultimately adopt the hospital update factor. Under the new proposed policy, ASC payment rates would be updated by 2.0 percent in 2019. I note that HOPD rates, because of a different set of payment adjustments, would receive a 2019 update of 1.25 percent, or .75 percent lower than ASC payments. In a significant policy development, CMS is proposing to eliminate many of the quality reporting measures to which ASCs have been subject for the past several years, thereby reducing our facilities’ administrative and financial costs. For 2020 payment determinations, the agency proposes removing ASC-8, Influenza Vaccination Coverage Among Healthcare Personnel. CMS is also proposing changes to the factors the agency uses to remove measures from the program, and importantly from OOSS’ point of view, to align these factors with the HOPD quality reporting program. Finally, CMS is requesting comments on the possible future validation of ASC quality measures. Like hospitals, ASCs have occasion to use expensive devices and operative supplies during certain surgical procedures. Although surgery centers are adept at achieving greater operational efficiencies than HOPDs, they are typically not able to extract greater discounts on devices and supplies than hospitals. Device-intensive procedures are those with respect to which the device cost exceeds a certain threshold of the total cost of the procedure, thereby providing additional payment for the device to the ASC. Currently, that threshold is 40 percent in both the HOPD and ASC. 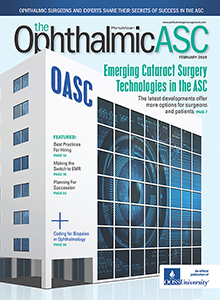 CMS is proposing to reduce the threshold applicable to the ASC setting to 30 percent, as recommended by OOSS and the ASC and ophthalmology communities. This will allow procedures that use relatively high-cost devices to be reimbursed at higher rates in the ASC setting, potentially augmenting migration from the HOPD to the ASC. With respect to the latter point, OOSS’ goal has been to ensure that ASCs receive as high a percentage of HOPD rates as possible, and if necessary, that hospital payments be reduced to ASC rate levels for procedures that can be safely and effectively performed in the surgery center. Upon a more comprehensive review of the proposed rule, I will provide you with a more elaborate explanation regarding the impact of the regulation on ASC vs. HOPD rates. In response to the opioid crisis, CMS is proposing to pay separately for certain non-opioid pain management drugs used in ASCs at a rate of Average Sales Price plus 6 percent (ASP+6). The agency is also seeking feedback on evidence to support such non-opioid alternative treatments. In last year’s payment rule, CMS delayed indefinitely the mandatory implementation of the Consumer Assessment of Healthcare Providers and Systems Outpatient and Ambulatory Surgery Survey (OAS CAHPS) under the ASCQR Program for CY 2018 data collection. For years, OOSS has raised serious concerns with respect to the size and content of and administrative and financial burdens associated with the survey, and joined the ASC community in lobbying for delay in requiring that facilities participate. CMS confirms in the proposed rule that the Survey will not be adopted in 2019. ASCs that implant lenses that have secured NTIOL status receive an additional $50 in facility reimbursement. CMS reports that there were no applications submitted by ophthalmics manufacturers requesting NTIOL status for lenses for the 2018 ASC payment rate rulemaking. In the physician payment rule published last week, CMS is silent with respect to taking any further action regarding payment of a facility fee for office cataract surgery. This is great news – FOR NOW!! As you know, OOSS is the only ophthalmology organization to unequivocally oppose the implementation of payment for office cataract surgery. We are hopeful that CMS’ decision not to press forward with the establishment of payments for office cataract surgery is a final one. Should CMS further proceed in the near or distant term, the OOSS leadership assures you that this is our most important regulatory priority and we will be aggressive and zealous in safeguarding the interests of our patients and our centers. OOSS members and friends, this proposed rule is significant in that it incorporates many of the policies that OOSS has proffered over the past couple of decades. However, we must keep in mind that this is a PROPOSED rule. We will be asking you to submit comments directly to CMS on key provisions and will provide you with all the tools to complete the task. OOSS will keep you abreast of further developments as well as instructions for members to submit public comments on the proposed regulation. Should you have any questions regarding the rule, please contact Michael Romansky, JD at mromansky@OOSS.org.